– Debove, S., Baumard, N. and André, J.-B. (2015), Evolution of equal division among unequal partners. Evolution, 69: 561–569. 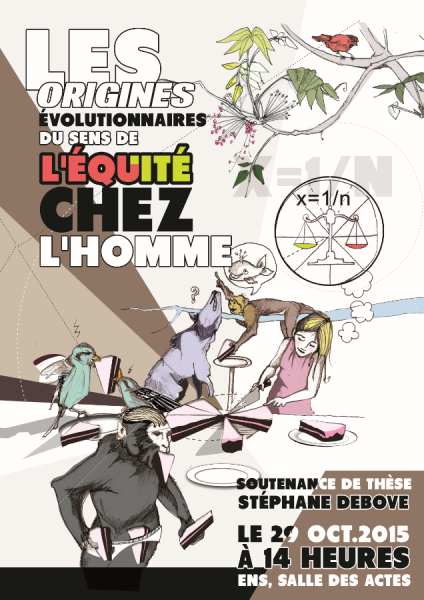 – Debove, S. (2014). Pourquoi les hommes sont-ils devenus moraux? L’Essentiel Cerveau & Psycho, numéro 18. (Online version here). – Radio interview, Peut-on innover en classe de sciences? France culture, émission du 10/10/2014. Listen to the podcast below or here. – TV Interview for the “Spécimen” tv show (RTS), in french, viewable here ici. – Debove, S., N. Baumard and J.B. André. Partner choice explains the evolution of meritocratic preferences in humans. EHBEA 2015, Helsinki, Finland. – Debove, S., N. Baumard and J.B. André. The evolution of proportionality by partner choice. Central European University 2014 Summer School, Budapest, Hungary. – Debove, S., N. Baumard and J.B. André. The evolution of merit by partner choice. Ecole thématique du CNRS: Morale et Cognition, l’épreuve du terrain. 2013, Centre culturel international de Cerisy, Cerisy, France. – Debove, S., N. Baumard and J.B. André. The evolution of merit by partner choice. 25th Annual HBES Conference (2013), Miami, Florida.